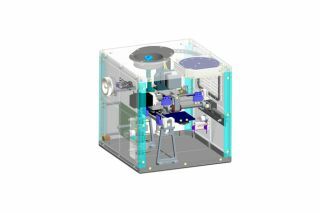 A schematic of the Portable On-Board 3D Printer, a small 3D printer headed for the International Space Station in 2015 for the European Space Agency. In order to ensure the printer does not affect the space crew's environment, Altran designed the machine to use a heat-based printing method and a harmless, biodegradable plastic. Europe's Pop3D printer won't be the first of additive manufacturing tool to reach space. Made In Space's 3D-printed objects, as well as anything POP3D produces, will eventually be returned to Earth and compared with identical items made with 3D printers on the ground. The comparison should help scientists determine whether 3D printed objects made in space work as well as they do on Earth. The Altran-built Portable On-Board 3D Printer, a small 3D printer headed for the International Space Station, is seen with examples of objects it can print during 2014 event at the Italian Space Agency. The printer will be delivered to the space station this year. "In the case of a complex injector of a rocket engine, we are able to take the total number of parts needed from around 250 down to one or two," one space 3D-printing advocate Steffen Beyer, head of Materials and Process Technology at Airbus Defence and Space, said in the ESA statement. "That represents a revolution in design and manufacturing."